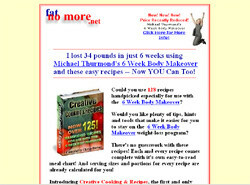 Blurb: Creative Cooking & Recipes for use with the 6 Week Body Makeover. Now lose weight faster & healthier than ever before! "Creative Cooking & Recipes" is a e-cookbook designed specifically for use with Michael Thurmond's 6 Week Body Makeover weight-loss program. It takes the guesswork out of cooking & measuring on the 6WBMO. Each recipe in this electronic cookbook comes with it's own easy-to-use chart. The recipe portions are calculated for you and the chart tells you exactly which body type and meal the recipe is compatible with. If your body type is listed on the chart for a specific meal, then the recipe is compatible with that meal. If it isn't listed, then it's not compatible. -Plus, you will save countless hours converting recipes and calculating their portions. Learn how you can do this yourself, quickly and simply. -And, 6 recipes that are totally "free" to eat.